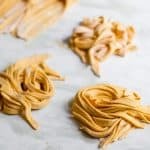 All you need is flour and pumpkin puree to make this vegan Two Ingredient Fresh Pumpkin Pasta. No special equipment required! To cook: bring to a boil two quarts of salted water. Drop noodles into the water a few at a time. Cook for two minutes, or until all the noodles float. Drain and top with sauce.